How ant colonies never forget...to kill! If you mess with even a single ant, you're entering a world of trouble. Ants memorize the smell of their enemies, and even just a handful of attacked ants will pass on this knowledge to the rest of the colony. That's the finding of researchers at the University of Melbourne, who test the memory capabilities of the tropical weaver ant. This particular species lives in tree-based colonies of up to 500,000 ants. 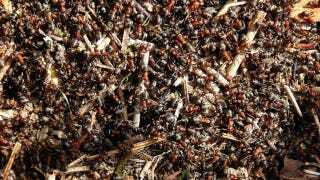 The researchers took an ant from one particular nest and had it spend time in proximity with strange ants from other nests. After a bunch of these trials, the ant was returned to its home nest, where it apparently proceeded to tell all its fellow ants that there were foreign enemy ants on the loose, and they had better be on their guard. "You have had an unsavory experience with a particular group of people with a distinguishing feature - perhaps they all wear the same colored scarf of their football team. And you warned your colleagues to look out for people wearing that colored scarf. One of the colleagues that heard you might subsequently tell another colleague who wasn't in the room when you made your comment. That colleague has acquired the information indirectly from the collective memory of you and your work colleagues. Change colleagues to ants, and scarf color to odor and you've got our story." Original paper at Naturwissenschaften. Via BBC News. Image by Polandeze on Flickr.